A painting stolen 20 years ago then found lying in a pile of rubbish on a New York City street could fetch up to $1m (£488,000) at auction next month. 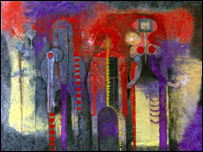 The 1970 painting Tres Personajes (Three People) by Mexican artist Rufino Tamayo was taken from a warehouse where the owners had placed it while moving. 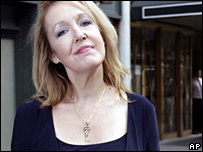 It was found by Elizabeth Gibson as she took her morning walk four years ago on Manhattan's Upper West Side. It is now being sold by the widow of the original owner. Elizabeth Gibson said she was drawn to the painting when she spotted it on the street. "I just knew it meant something. ... It was extremely powerful, and even though I didn't understand it. I knew it had power," she told the Associated Press news agency. She said she had learned of the work's worth when her research led her to the website of Antiques Roadshow FYI, a companion programme to the American show Antiques Roadshow, on which the painting had featured. She will receive a $15,000 reward the couple put up when it was stolen, plus an undisclosed percentage of the sale of the painting. It is still not known how the painting ended up on the street. The owners - a couple from Houston whose names have not been disclosed - bought the oil on canvas, with marble dust and sand worked into the paint, in 1977 at Sotheby's. August Uribe, Sotheby's senior vice-president of Impressionist and modern art, said that the husband had paid $55,000 for it as a gift for his wife. The husband later died. At the time of the theft in 1987, the couple alerted local and federal authorities. Information on the painting was posted on the databases of the International Foundation for Art Research, and the Art Loss Register. Sotheby's said the painting, which it described as an important work of the artist's mature period, would go up for sale at its Latin American Art auction on 20 November.